Handy Art® Pumpkin Painters are a fun way to decorate pumpkins, offering a creative and safe alternative to carving and candles. Filled with Handy Art® Tempera Paint, our markers have pressure sensitive valves which ensure they won’t spray when squeezed. Complete instructions with ideas included. Fun for all ages! 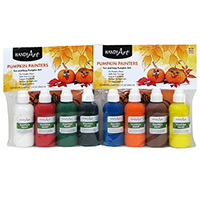 Handy Art® Pumpkin Painters are certified AP non-toxic.